By Edited by Heshmat Moayyad, Translated by scholars at the University of Chicago In Fiction Tagged In 20th Century, Houshang Golshiri, and Short Stories. This collection of thirty-five Persian short stories by twenty-six of Iran’s best known contemporary writers gives voice to the concerns, strivings, and visions of their generation. In styles ranging from the dark to the humorous, from the elegant to the poetic, these stories depict aspects of both traditional and modern life in Iran with its many religious, political, cultural and class tensions. The expanding role of women in Iranian society is attested to both by the large number of women writers included in the volume, and by the central role played by women in many of the stories. Written during the last 75 years and arranged in chronological order, these stories span a period in Iranian history from the Constitutional Revolution (1906-11) through the long reign of the Pahlavis (1925-79), the upheavals of the 1950s, the 1979 Islamic Revolution, to the present. 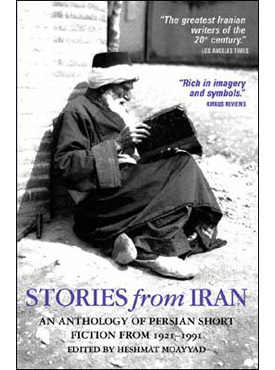 Stories From Iran was selected, edited, and translated by scholars of Persian Literature at the University of Chicago. Accompanied by a complete glossary, author biographies and photos, it will give the reader an unmatched insight into Iranian life–an insight that only true works of art can provide. Heshmat Moayyad has been a professor of Persian Literature at the University of Chicago since 1966. He studied at the University of Tehran and received his doctorate in Middle Eastern studies from the University of Frankfurt. He has also taught at Harvard University, the Univeristy of Naples and the University of Frankfurt. Professor Moayyad has written, translated, and edited several books in English, German, and Persian. He edited the collection Stories from Iran: A Chicago Anthology For Mage Publishers.